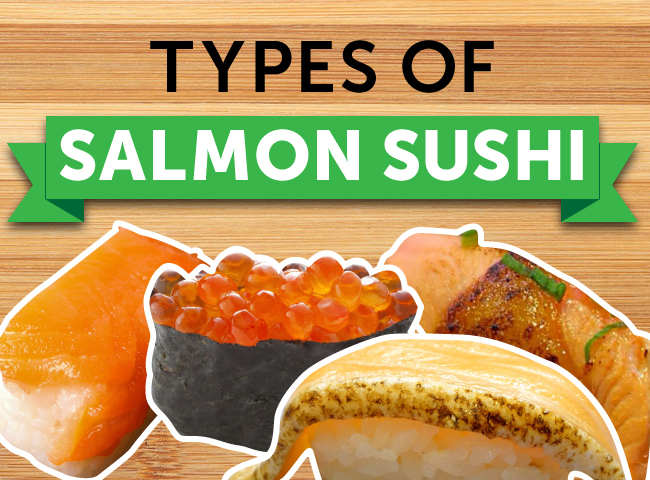 Sushi may conjure up images of a neatly rolled maki-zushi filled with avocado and salmon, or a perfectly proportioned piece of tuna nigiri—however, there are many other different types of sushi that are commonly eaten in Japan. Temaki is an ice cream cone-like sushi roll, chirashizushi is a bowl of sushi rice with ingredients “scattered” over the top, and temari are little rice balls topped with a colorful array of ingredients. 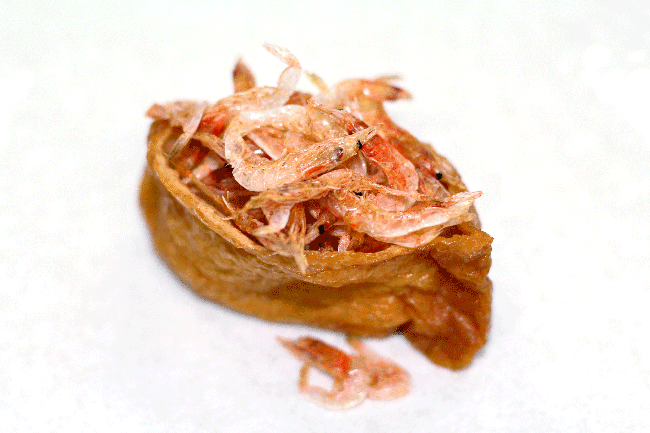 Inarizushi (or, inari-sushi) is another unique variety of sushi, a sweet bean bag-looking morsel, made with a pocket of sweet deep-fried tofu known as inari filled with sticky Japanese sushi rice. In Japan, inarizushi can be widely found in all variety of sushi restaurants, ordered as a side dish at many noodle and teishoku (set meal) restaurants, and is a popular addition to bento boxes. Although not thought of as a dessert, it's sweet flavor offers a sense of having a sweet treat with a meal. Inarizushi is named after inari shrines found all across Japan, which are dedicated to the shinto god for fertility, rice, agriculture. The messengers to these deities are said to be foxes and according to folklore, their favorite food is inari. 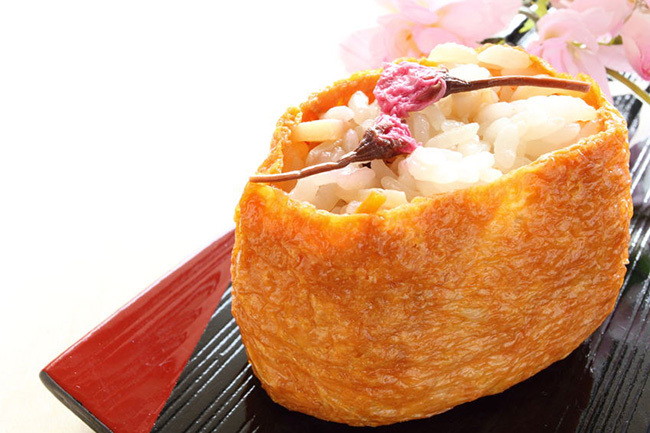 At its most basic, inarizushi is a pocket of rice, but it is as about as versatile as a sandwich, as it can be filled with a huge array of ingredients. 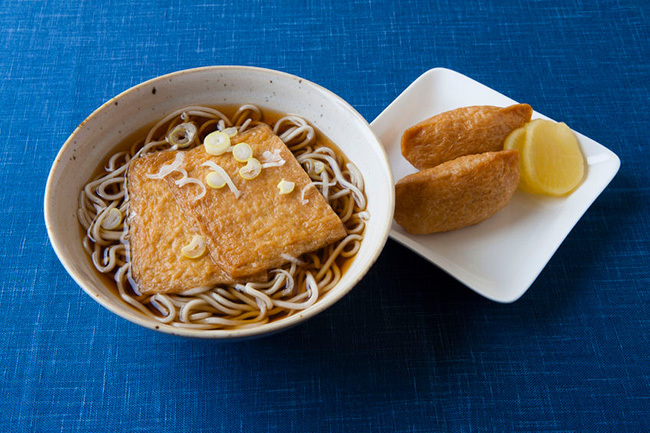 The tofu pocket of inarizushi is known as abara-age or inari-no-moto, a sliced and deep-fried tofu which is then simmered in a mixture of mirin, soy sauce and dashi (Japanese stock). It can be purchased easily in Japanese supermarkets, and leftover pockets can be cut into strips and added to dishes for a sweet and savory flavor. As with other varieties of sushi, inarizushi uses sushi rice. 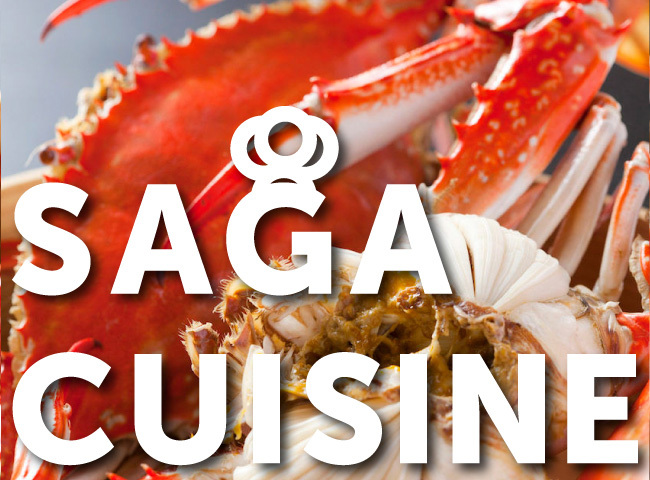 To prepare this, a mixture of rice vinegar, sugar and salt is mixed through steamed rice, which creates a subtle balance of sweet, sour and salty flavors. Japanese rice is the short grain variety, with a high starch content. 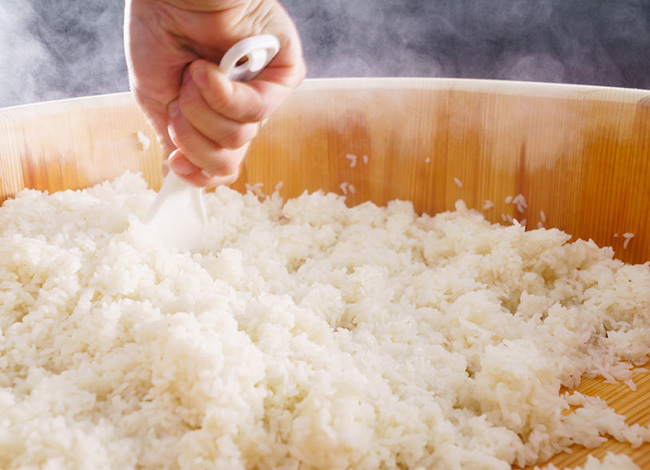 This allows the rice grain to absorb a lot of liquid, making it sticky and easy to pick up with chopsticks as well as mold into shapes. 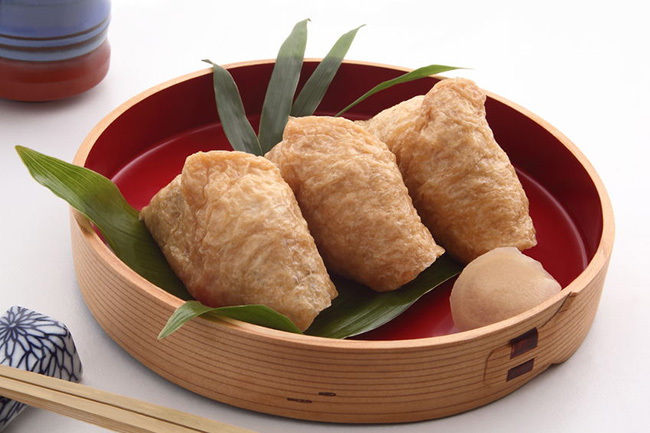 For inarizushi, a handful of rice is pressed together into a log shape, similar to that of nigiri, then placed inside the inari pocket. 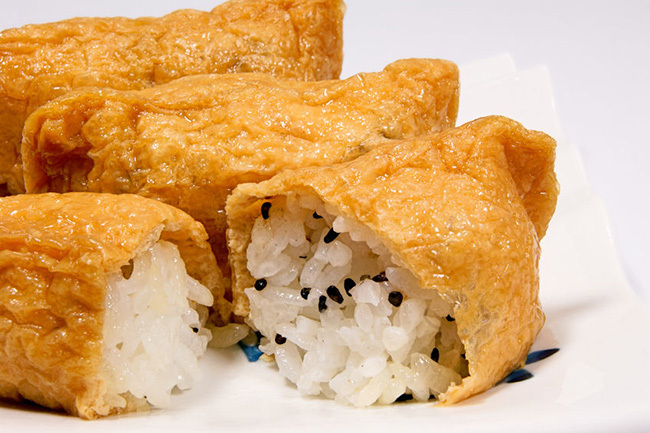 Inarizushi may be either rectangular-shaped or triangle shaped, more like onigiri. Historically, the triangle shape is found in the Kansai (Western Honshu) region of Japan, and the rectangle in Kanto (Eastern Honshu). Both black and white sesame seeds are a popular addition to inarizushi. A sprinkling is added to the rice and mixed through, creating a simple but decorative appearance and a nutty flavor element. 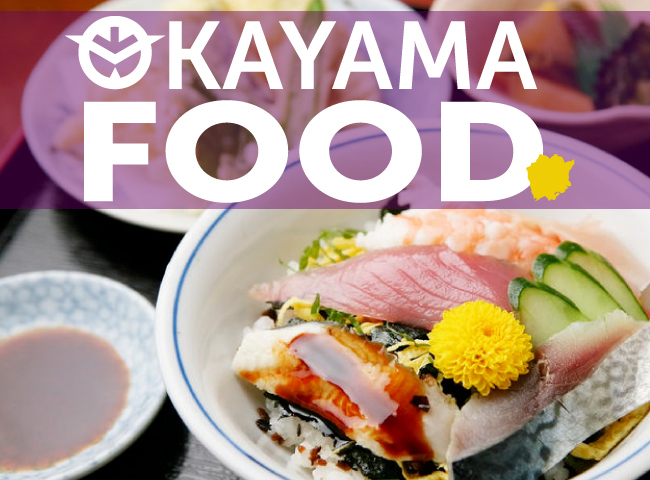 During cherry blossom season, food is often adorned with cherry blossoms that have been preserved in salt, making for a festive and decorative food to be enjoyed during this special time of year. Hanami bento (cherry blossom viewing bento) is a popular food eat at picnics, featuring inarizushi with pickled cherry blossoms either placed on top of, or mixed into, the rice. Sakura refer to Japanese cherry trees, famed for their pink cherry blossoms which bloom from March to May across the country. Sakura ebi are tiny pink-colored shrimp (ebi) which are a popular addition to Japanese meals, adding a hint of seafood flavor along with a decorative element. Inarizushi may be topped with raw, cooked or dried sakura ebi, sometimes combined with other ingredients such as tobiko (fish roe) or shirasu (baby sardines). Tsukudani is a Japanese cooking preparation technique where ingredients are simmered in a rich and flavorful mixture of soy sauce, dashi, mirin and sugar. 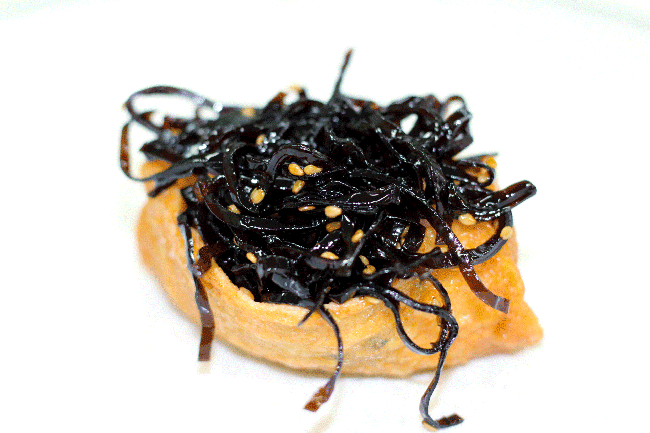 Tsukudani kombu (a type of seaweed) is a popular addition to rice dishes and salads in Japan, and can be used in inarizushi. 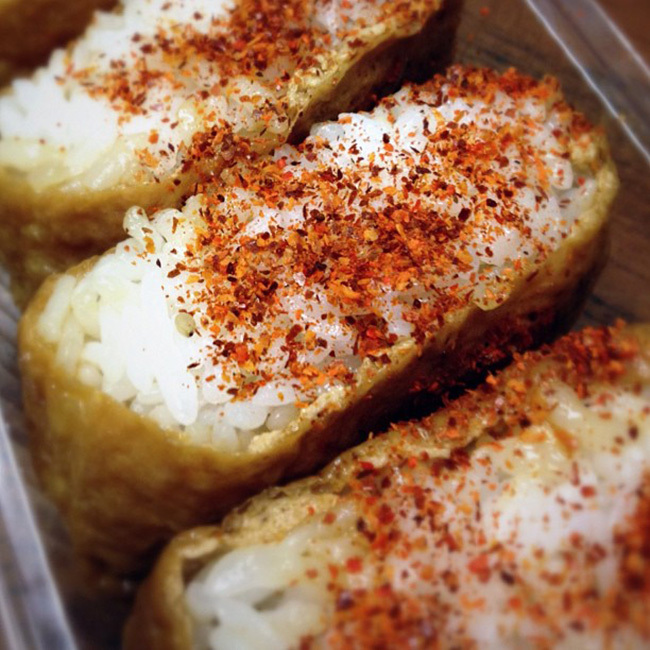 For a sweet and spicy version of inarizushi, Japanese shichimi togarashi spice, can be sprinkled over the open rice pockets. This is a very commonly used condiment that is a blend of seven (shichi) spices - red pepper, sansho pepper, roasted orange peel, black and white sesame seeds, seaweed and ginger - that has been used in Japan for hundreds of years. 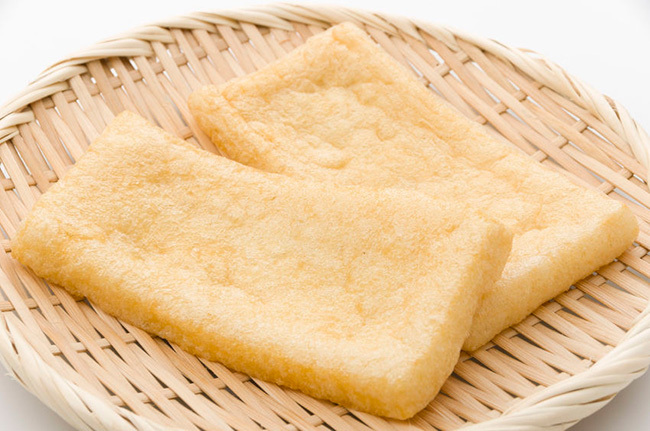 Kinshi tamago is very thinly sliced usuyaki tamago, a thin egg crepe. 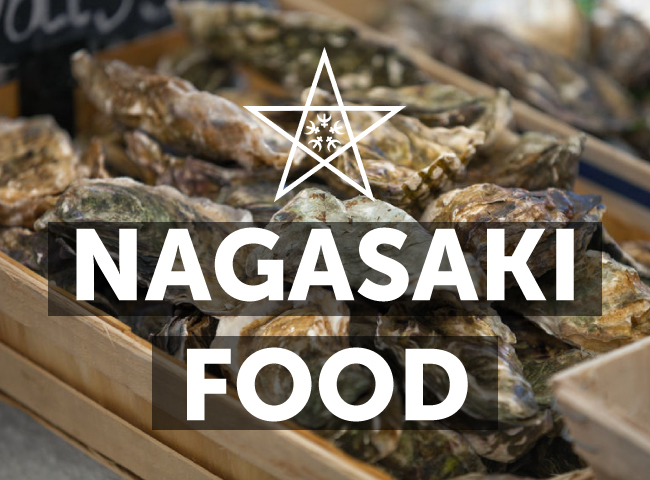 It’s used in Japanese dishes for decoration and a hint of flavor and a protein source. Gomoku means “five ingredients,” so gomoku inarizushi actually has an extra three ingredients in addition to the rice and tofu pocket. 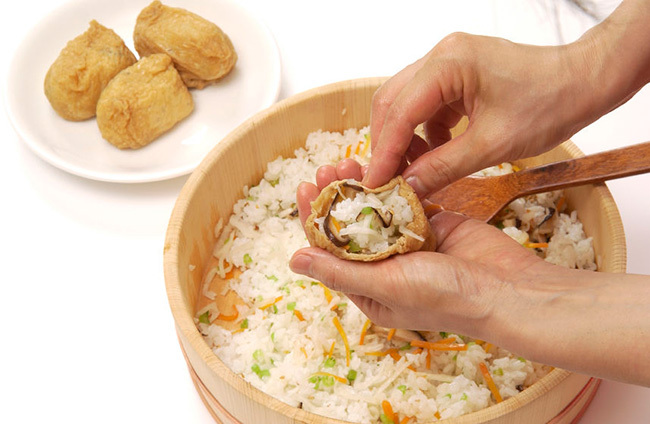 Most commonly, these are any combination of shiitake mushroom, edamame beans, hijiki seaweed, carrot and sesame seeds, and are mixed into the rice before being stuffed into the inari pocket. Seaweed salad is popular both within Japan and at Japanese restaurants outside Japan. It may be any type of seaweed, but is often rehydrated dried kombu, thinly sliced and mixed with a dressing of sesame oil, rice vinegar, soy sauce, sugar, sesame seeds and dried togarashi chilies. 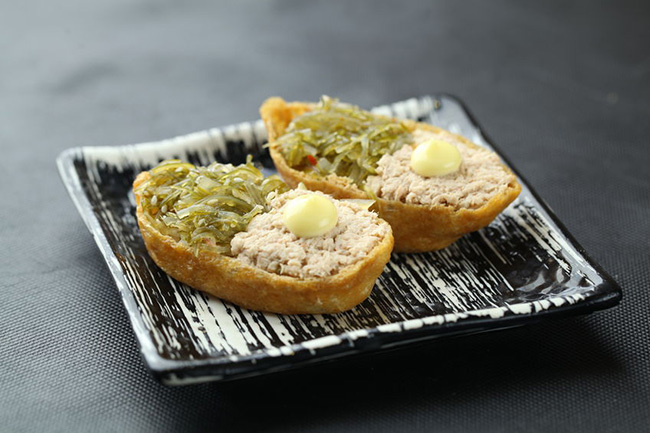 Seaweed salad is placed on top of inari pockets. The flexibility of inarizushi lends itself to other sorts of fillings—tuna salad, crab meat, potato salad, egg and mayonnaise. 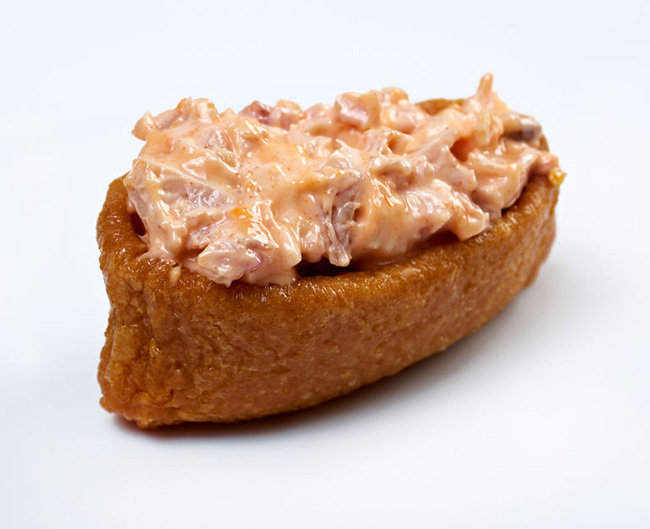 In Hawaii, a variety of inari stuffed with a stew of ground mince and vegetables can be found! 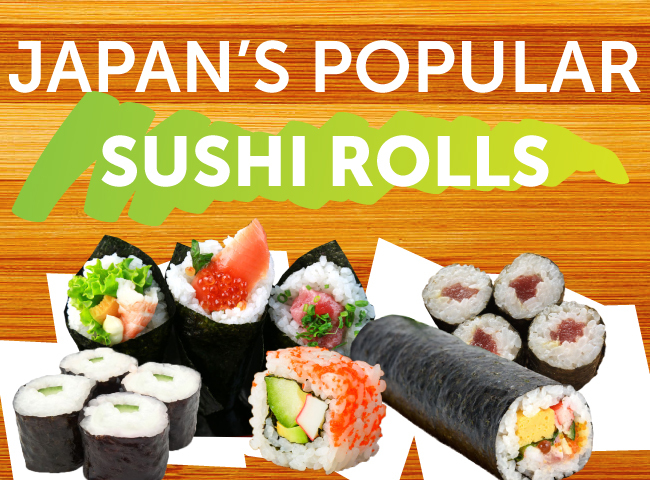 Just because it’s categorized as a type of sushi, modern inarizushi versions may include other carbohydrates in place of the traditional sushi rice. 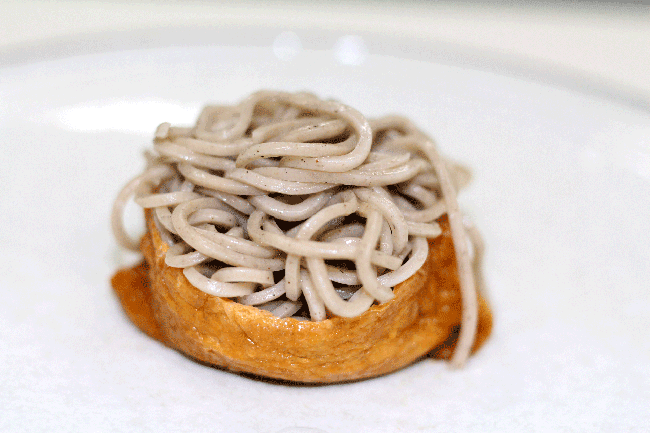 Soba noodles (Japanese buckwheat noodles), somen (thin wheat flour noodles) and even quinoa, a South-American grain, can be found inside inarizushi. 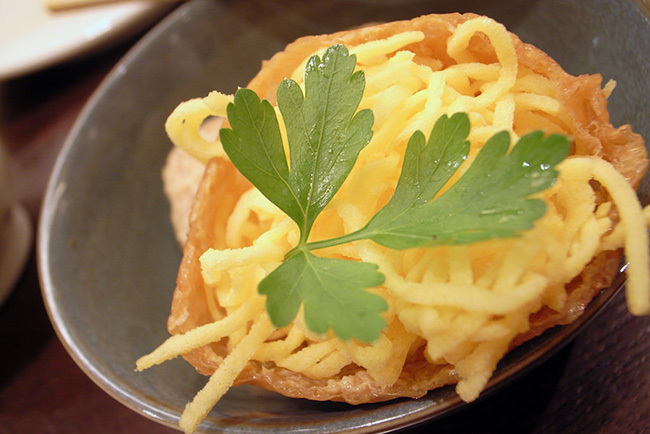 These are usually mixed or topped with other ingredients, such as pickled ginger or chopped negi (shallots). 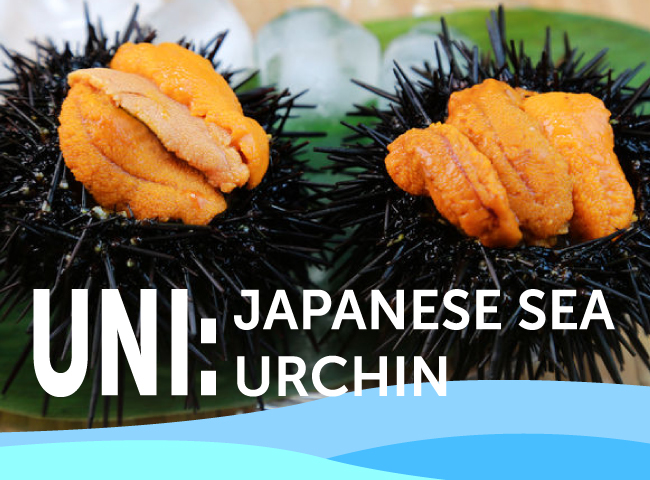 While there are many different types of sushi to try in Japan, inarizushi is . Sweet, widely available and easy to eat. 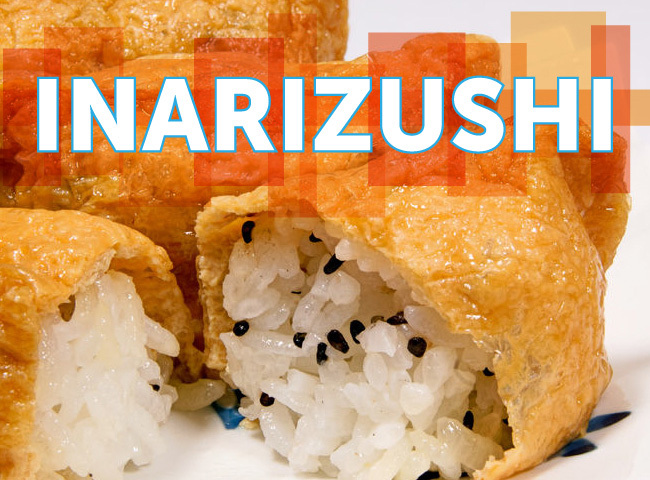 Why not substitute a sandwich for your next lunch with a creative type of inarizushi filling? If you’re in Japan, browse Gurunavi’s sushi restaurant listings to find somewhere to try inarizushi.